When it comes to screen printing shirts with your logo or design you are buying the industry standard in logo wear. There are several different methods to imprint apparel in addition to screen printing. Some of these are dye sublimation and transfers. Each of these have their own place and are great for particular needs. However the tried and true method for quality graphics and apparel is screen printing. It’s a method that originated over 2,000 years and progressed to a more modern semblance using silk which is where the silk screen printing term originated. Today the mesh of the screens that hold the image is not made of silk but the name still sticks. As screen printing is the industry standard that means you are getting the best value for your logo wear. Every major brand manufacturer uses the screen printing method on their own promotional logo apparel. The method is one of longevity and durability and with the advances in technology t-shirt companies can now print amazing detail in a customer artwork. 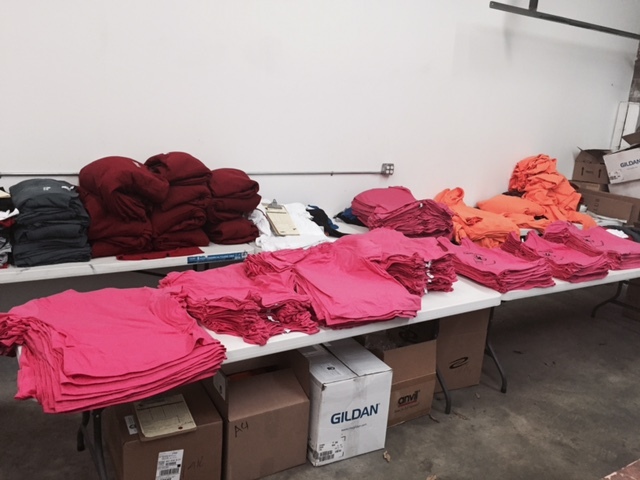 If you are going to invest in your brand with logo apparel then to have your logo printed using any other method than screen printing is doing a disservice to your brand and your wallet. When it comes to screen printing shirts you have several options based on the history of apparel. With technology and trends you now have more options than ever when it comes to investing in your logo wear. There is always the cotton aparel, the blend apparel, but now performance poly fabrics are popular as they are light weight and provide cooling and dry wicking properties for athletes and because they are comfortable they are great for every day wear. More and more companies have come out with a triblend shirt with combines cotton, polyester, and rayon to make a light weight super soft feeling shirt. All of these substrates are great for screen printing shirts and it’s not just shirts. You can order a full line of apparel from shirts, jackets, sweatshirts, shorts, sweatpants, jerseys, bags, and much more. To get a free price quote on your next screen printing order contact us at Kirkwood Trading Company and we will be happy to put a price quote together for you.